This is the "Insect Issue" of Quinto Lingo.2 It contains facts about flies, bees, termites, ants, locust plagues, mosquitoes, black widow spiders, using insects to predict weather, moths, butterflies, fleas, crickets and more. ENGLISH: Two fleas came out of a movie. "What do we do? Do we go home on foot, or do we go by dog?" ITALIAN: Due pulci escono dal cinema. "Che facciamo? Andiamo a casa a piedi o cavallo ad un cane?" GERMAN: Zwei Flöhe kamen aus dem Kino. "Was machen wir? Gehen wir zu Fuss nach Hause, oder gehen wir per Hund?" According to Carlton Jackson's 1974 book "R.I. Rodale: Apostle of Nonconformity," Quinto Lingo was published by Rodale from 1964 to 1971, when it was sold to Learn-En-Joy, Inc., of Arlington, Virginia. Karen S. Chung: "Quinto Lingo made a big difference in my own life. My father subscribed to it for my sister and me when I was about eight, in an effort to help us keep up and expand our knowledge of German, which he was teaching us at home. In addition to getting exposure to the major European languages, I was intrigued by the subject matter of many of the articles. ... Mario Pei became a household word for me. There were dialogues, fables, jokes, crossword puzzles, recipes. The ads were almost as much fun as the articles." Yehuda N. Falk: "For reasons unbeknownst to me, my parents had a subscription to it. It may have been for my benefit, as I have always been interested in language, but I don't know for sure. ... I, too, learned the name Mario Pei from Quinto Lingo, and when I was in high school in the 1970s I read some of his more pop-science oriented books. How much of a role did it have in my becoming a linguist? I honestly don't know." Lorna Feldman: "I think I still have all the copies from my subscription which I had during junior high. The magazine certainly was an influence on my decision to go into linguistics, but I subscribed to it because I already loved studying languages. One thing I remember was folding the pages so I wouldn't be tempted to read in English." Read more Quinto Lingo memories here. 1. Regarding the Romance languages, Wikipedia states in this entry that "although Portuguese and Spanish are closely related, to the point of having a considerable degree of mutual intelligibility, there are also important differences between them, which can pose difficulties for people acquainted with one of the languages who attempt to learn the other." Furthermore, there is a difference between Portuguese and Brazilian Portuguese, which is spoken by nearly 200 million people. (I taught English to a speaker of Brazilian Portuguese during my days as an ESL instructor in the 1990s.) Per Wikipedia: "Some authors compare the differences between Brazilian Portuguese and European Portuguese to those found between British and American English, while others see the differences between Brazilian and European Portuguese as greater or much greater." 2. It would seem that the lovely cover illustration has nothing to do with the issue's theme of insects. The illustration is listed as "courtesy of KLM Royal Dutch Airlines." I have no idea what the connection is there. 3. 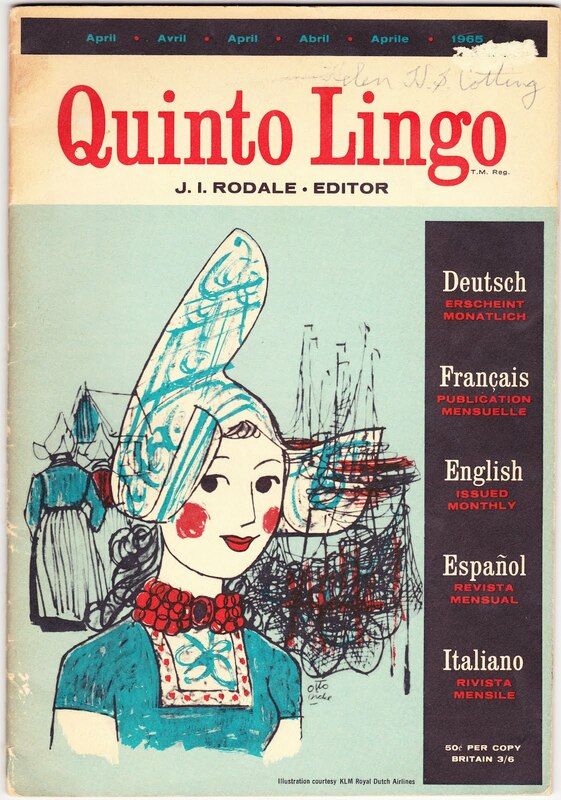 Specifically, the Quinto Lingo threads on The Linguist List are here and here.